Tender pecan crescent cookies made with almond flour. These easy and delicious low carb cookies are a must make for the holiday season. They also make great snowball cookies too! And at 4g total carbs per serving, you can afford to indulge. These low carb pecan crescent cookies are full of deep and emotional nostalgia for me. Pecan crescents were my father’s favorite Christmas cookie, and as many of you know, he died a few years ago right around Christmas. I miss him terribly but I am lucky I got so much time with him in the end. I originally created this recipe in 2012, long before his diagnosis of idiopathic pulmonary fibrosis. He and his wife often used to spend Christmas with us when we lived in Boston, before he got too ill to travel. One holiday, I was inspired to attempt a low carb version of his beloved pecan crescents. And I was absolutely delighted by how they turned out, and how pleased he was to indulge in my healthier version. They have the same soft and yet slightly crumbly texture of the original, and the same delicious pecan flavor coming through, without an ounce of sugar or gluten. The old man gave them two thumbs up. It truly is astonishing what you can accomplish with a stick of butter, a bag of almond flour, and a willingness to experiment. I decided that in his honour, I needed to update this old post and give them some pretty new photos. Pecan crescents are akin to shortbread and they have that unique sandy texture of a typical shortbread cookie. To shape them, you simply roll them into balls and then form them into crescents. Or you could simply leave them as balls and turn them into pecan snowballs. Be sure to use finely chopped, toasted pecans. If the pecan chunks are too large, it’s harder to roll and shape the cookies properly. Our traditional family recipe took brown sugar. At the time I first created these, I subbed in granulated Swerve and some molasses, but now that Swerve has a brown sugar substitute, it’s perfect for these cookies. If you can’t find Swerve Brown, try regular Swerve and 2 teaspoons of Yacon or molasses. We used to decorate our cookies with some canned vanilla frosting that we thinned out with a little milk. Ugh, can you believe that? Now I simply whisk together a little vanilla glaze with powdered sweetener and heavy cream, and it’s just as good. Sadly, there really aren’t any great sugar-free sprinkles out there. I just use a few holiday sprinkles on the frosted cookies to give them a festive flair. You could also simply roll them in powdered sweetener. I did that to half of the pecan crescent cookies this time and they were lovely that way. If you want to make snowballs with these cookies, you simply roll them in powdered sweetener after they’ve cooled. This recipe makes a lot of cookies so it’s perfect for holiday parties or gift-giving. The great thing is that the cookies freeze well both baked and unbaked. For unbaked, simply wrap the dough up tightly in plastic and freeze. Thaw before shaping and rolling into crescents. If you want freeze the baked cookies, let them cool properly first. Freeze before frosting or rolling in powdered sweetener. They can last in the fridge for up to two months. So there you go, Dad. I am sending a healthy keto version of your beloved Pecan Crescent Cookies into the world so that people can enjoy them. Miss you! Want more great Keto Holiday Cookies? 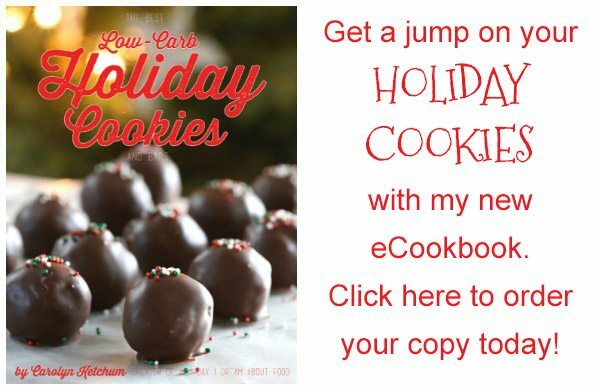 Looking for the best low carb holiday cookie recipes? Preheat oven to 325F and line 2 baking sheets with parchment paper. In a medium bowl, whisk together almond flour, chopped pecans, coconut flour baking powder and salt. In a large bowl, beat butter with Swerve until light and fluffy, about 2 minutes. Beat in egg and vanilla extract. Beat in almond flour mixture until dough comes together. Form dough into 3/4 inch balls, then roll between palms and shape into crescents. Lay on prepared baking sheets and bake 15 to 18 minutes, or until just lightly golden brown. They will not be firm to the touch, but will firm up as they cool. Cool on the pan. Whisk powdered Swerve with 1/4 cup cream and vanilla extract until smooth. Add 1 tbsp more cream at a time until a thin but spreadable consistency is achieved. Spread on cooled cookies and decorate as desired. Or simply roll the cookies in powdered sweetener. Serves 20 (2 cookies per serving). Each serving has 5.2 g of carbs and 2.2 g of fiber. Total NET CARBS = 3 g (minus the sprinkles, but those don't add much if used judiciously). Now I have liked both Facebook sites, and are following both pages on Pinterest. These look so fun… how great of you to recreate your father’s favorite treat! Snickerdoodles – must bake Snickerdoodles every year! Shortbread cookies are my favorite!!! My favorites are sugar cookies! So glad several bloggers have come out with sugar free “sugar cookies” this year! My favorite cookie? What a hard one. Of course it has to be gluten free and warm from the oven. What would Christmas be without moist sugar cookies …or gooey warm chocolate chip cookies…or matrimony date bars the Canadian way? It’s way too early in the morning to be thinking cookies but my tummy is growling already. COOKIES! Love your FB page and have shared it with others. My cousin mentions it all the time to me. Would love to win the contest because I’m just at the beginning of my gluten free path and have so much to learn. Chocolate chip Cookies and I just found a recipe using coconut flour and they turned out great. Just a personal thought from someone who loves your recipes and site, we make peanut butter kiss cookies in droves! I love the pampered chef! I’ve only thrown one party by them myself but it was so much fun and their products are great. My favorite christmas cookie is a sugar cookie, I think. Though it is hard to argue with a classic chocolate chip. I follow pampered chef on pinterest! My fav Christmas cookies are Snickerdoodles! My favorite Christmas cookie is a nice chewy snicker doodle!!!!! I follow The Pampered Chef on Pinterest! I follow All Day I Dream About Food on Pinterest! I like The Pampered Chef on Facebook! I like All Day I Dream About Food on Facebook! Chocolate chippers. Basically a chocolate chip cookie using choppped German chocolate instead of semi sweet chips. Great childhood memories when I eat them. 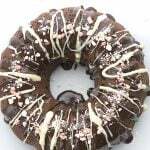 I liked Pampered Chef on facebook! I use their mini cookie scoop every week! I love sugar cookies because I can decorate them! I will have to find a LC replacement though. I followed Pampered Chef on Pinterest. I followed All Day I dream about Food on Pinterest. I liked All Day I dream about Food on FB which I am thrilled about! An ancient family recipe is Sour Cream Sugar Cookies. This makes a soft, not too sweet ciikie. Your Sour Cream Sugar Cookie sounds enticing, and I love making ancient recipes that have been in the family for generation, and passed down. Can you share the recipe? The cookies sound delicious, and I’d love to try them. Oooo, what a great giveaway! favorite Christmas cookie is soft ginger cookies…yummm! love your recipes! I love shortbread cookies during the holidays. Our favorite cookie is almond cream cheese spritz. I would love to win this for my daughter because she is getting married this next year. My favorite low carb Christmas cookies, so far, are your Chocolate Peppermint Sandwich cookies. The peppermint filling is delicious! (the coolness from the erythritol works wonderfully with the mint!) My hubby prefers the cookies without the filling…and they are fantastic without. Followed the Pampered Chef on Pinterest. I follow pampered chef on facebook. Favorite Christmas cookie is snickerdoddles. I followed Pampered Chef on Facebook! I followed Pampered Chef on Pinterest! My favorite Christmas Cookies are basic sugar cookies using cookie cutters… will be trying on of your recipes this year! But, I cannot wait to try these pecan cookies! My favorite cookie are almond flour “sugar” cookies with icing and sprinkles! Yum! I “like” All Day I Dream About Food on Facebook! I also follow The Pampered Chef on Pinterest! I “like” ADIDAF on Facebook! My favorite Christmas cookie is the peanut butter with a Hershey’s Kiss on top. I liked All Day I Dream About Food on Facebook. I liked The Pampered Chef on Facebook. My favorite cookie is hands down a mexican wedding cake!! Mmm! Your crescents look so pretty! My favorite Christmas cookies are Pecan Lassies and I tell my mom each year, how horrible at making them I would be 🙂 so she will make them for me. She called me yesterday when she put them in the oven. Yep, I’m a brat some days, but she says she doesn’t mind. There is a Swedish almond-flavored cookie that I get once a year at our catered work party. Amazing! I like frosted sugar cookies and the peanut butter ones with the chocolate star or kiss. My favorite Christmas cookie is Mexican Wedding cakes. Pampered Chef rocks! Holy crap! Sorry…but wow that is an awesome package! I looooove pampered chef 🙂 My fave cookies to make and eat this time of year are decorated sugar cookies. How hot of an oven to cook these at? Maybe I have overlooked it? My favorite Christmas cookie/s is any cookie that I can make with my grandchildren helping!!!!! I rarely get to see them because they live in another state and just watching them laughing and giggling when they are helping Grandma Red make them puts a big ol smile on my face everytime!!!!!! My favorite Christmas cookies are Russian tea cakes, aka wedding cookies. I think your recipe will work very well for those. My favorite cookie is the Peppermint Drop…..pretty too!! Wow, I don’t know my favourite. I’d guess spritz cookies. They are so fun to make & decorate with children. However, when getting fancy, or sharing with friends, I usually head to a bar cookie, as they are easier to make in a multitude in a small kitchen. My Pinterest name is Julie Alison. Followed All Day I Dream About Food on Pinterest. Liked The Pampered Chef on Facebook. Facebook name is Julie Alison. Liked All Day I Dream About Food on Facebook. My grandma makes these amaaaaaaaaazing almond shortbread bars. I literally hide them in my pockets to take home. I follow you on Facebook and Pinterest! Basic sugar cookies that can be decorated for Santa! Thanks for all of your wonderful recipes. I’ve never had one not turn out as promised. Favorite Christmas cookie: My mom got a recipe from her sister’s mother-in-law (confusing) a long time ago for fruitcake cookies. Wow! I never really like fruitcake but these were different but also so colorful and I wish I had some right now! I have all the ingredients to make your dad’s cookies though so I’ll give those a try instead! They can be frozen without the glaze? Would they be bad frozen with the glaze? I just think the glaze wouldn’t thaw very well! I have a recipe I love that I’ve always called Killer Cookies. They’re basically a chewy chocolate chip, pecan, oatmeal, and coconut cookie. Definitely not low carb! my favourite Christmas cookies – what my well-loved grandmother used to call bird’s nest cookies: kind of a shortbread, rolled in chopped walnuts (or was it pecans? ), ruby-red jam nestled in a slight depression on top. oh my yummy. and associated with such warm memories! I liked All Day I Dream About Food on Facebook! I liked The Pampered Chef on Facebook! Nothing beats the classic sugar cookie. I like PC on facebook. I love a classic butter cookie! I’m sugar free gluten free now, but in the day I always enjoyed a frosted sugar cookie, pecan tassies, and sweeties. To tell you the truth I ABSOLUTELY LOVED COOKIES, they were my favorite dessert, and I had a hard time turning them down & with diabetes I finally had to say no – can you say I was a sugar addict junkie! FREE for 1.5 years YAY!!! My favorite cookie is your Chocolate Peppermint Sandwich Cookies! They are to die for! I made a batch for work and no one knew they were LC or GF! I liked Pampered Chef on Facebook! I think I have a new favorite cookie, cocoa nib and pecan butter cookies. They’re addictive. My favorites are gingerbread cookies. I bake some every year. I’m following Pampered Chef on pinterest! I liked PC on FB! One favorite cookie? Hard to do that! I love chocolate chip cookies with walnuts, sugar cookies with frosting, shortbread cookies and chocolate crinkles. And let’s not forget peanut butter. I follow Pampered Chef on Pinterest. I’m going to make these!! Yum. My favorite Christmas cookie is actually a candy…. I make an old family recipe for pralines that rocks my world. Or used to, anyway! 🙂 If you could figure out how to make a sugar-free praline (is that even possible since it’s mostly sugar?) I’d love that! This year I’m going to try a low-carb sugared pecan recipe and see if it’s a satisfying replacement. followed pampered chef on pinterest. I follow All Day I Dream About Food on Pinterest. My favorite Christmas Cookie is a really spicy ginger cookie. I’m now liking Pampered Chef on FB. I’m following you on Pinterest. Yay! I LOVE Pampered Chef! My favorite cookie is double chocolate chip. My favorite Christmas cookies are peanut butter kiss cookies and pecan tassies. Haven’t found a way to make the tassies low carb, yet! I like All Day I Dream About food on Facebook. My favorite is my mother’s fruitcake cookies. 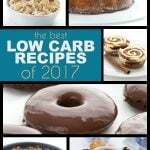 I have been making them as low carb as possible for the last three years. Traditionally you soak the candied fruit in whiskey over night. These cookies are mostly pecans with a touch of fruit. I have got the flavor down pat. I’m still working on the texture. I substitute dried fruit for the candied cherries and pineapple, but finding sugar free dried fruit is a challenge. I love your blog, cookbooks, and recipes. Please keep them coming! Happy Holidays! I like Italian Knots cookies. I eat way too many when they are around. I LOVE your Chocolate Peppermint cookies, actually! And now that I have to do low-carb (T1D), they are now my new favorite. I have always liked peppermint at Christmastime. Have a great holiday, and I’m praying I win the giveaway! I liked PC on Facebook. I now follow PC on Pinterest. Favorite cookies is “Magic Cookie Bars”, that replace high carb version “Hello Dollies”. What a great giveaway! I love pecan lace cookies. I’m able to make something similar using low carb ingrediants. Following Pampered Chef on Pinterest. I like Pampered Chef on Facebook. My favorite Christmas cookie? Like I could choose a favorite? It has to be a tie between Russian Tea Cookies and Chocolate Crinkles! Hey, I call them Russian Tea Cookies too! I was just telling my husband yesterday about the multiple names for those cookies…Mexican Wedding Cakes, Snowballs, etc. I am following Pampered Chef on Pinterest. I like ADIDAF on Facebook. My favorite cookie is brown sugar shortbread. I follow All Day I Dream About Food on Facebook. My favorite Christmas cookies are Raspberry Thumbprint Cookies. I follow you on FB. As for my favorite cookie, that is SO hard to say. I guess I would have to go with chocolate chip, but looking at what you have shared today, and someone suggested making them into wedding cookies, boy, close second! I follow the Pampered Chef on Pinterest. We always had gingerbread men, sugar cookies with peppermint icing, and rum balls (for the adults). I followed you on Pinterest! And I’m glad you’re on there! I liked you on FB a long time ago! My favorite cookies are rugelach. They never last till Christmas, I have to hide them! Gosh what a great giveaway! Thank you! Favorite Christmas cookie is Oatmeal Raisin made by my mother in law. Have no clue what is in it but they are big and fabulous. Not seeing her this year and will miss those yummy cookies. Liked all FB and Pinterest pages. Love your blog! I will follow Pampered Chef and wonder why I did not before this request. Love Pinterest! My favorite cookie is most definitely the snowball/snowdrop/Mexican wedding cookies! Plain old Chocolate Chip are the favorite cookie in my house ! I liked you on facebook ! Oatmeal raisin cookies are my very favorite. My favorite kind of Christmas cookie has got to be gingerbread cookies! X3 They taste like the holidays, and my mother’s are the absolute best! 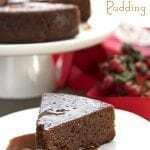 Hi Tiffini…this recipe would lend itself well to Russian Tea Cakes. I’ve been thinking the same thing. I love your cheesecake ginger bites. I’m going to make these pecan cresants today! I love all things pampered chef! I already like you on facebook, and I have liked pc on facebook! Merry xmas! oh and my fave cookie is good old fashion chocolate chip! My favorite cookie is Pecan Tassies. I don’t use Pinterest, but I like both you and Pampered Chef on Facebook. These look wonderful, and I love any cookie with pecans, including my favorite, pecan shortbread. Frosted sugar cookies are definitely my favorite! I like The Pampered Chef on FB. favorite Christmas cookies are old family traditions with family names – Pennsylvania cookies: an almond hazelnut crescent and honey balls. Am trying to sub almond flour in each of them, will see how they turn out. My favorite are jam thumbprints! I would love to get the Pampered Chef gift. 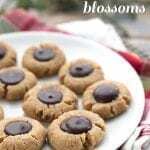 My favorite cookie is Peanutbutter Blossom, made low carb. Thanks and Merry Christmas to you and your family. My favorite Christmas cookie is chocolate chip! My favorite Christmas cookie is chocolate chip with walnuts! My favorite Holiday cookie is just the chocolate chip cookie I think. Trying to find a low-carb version of my favorite…Pecan tarts!! I love your website! I am on it everyday. I have been doing Clean Eating for 4 months and love finding new things to make. My favorite cookie is Shortbread or Peanut butter. Thanks for all you do to help us! I love Pampered Chef products, too. Have a great holiday season! Gingersnaps, but really ANYTHING. I’m a sucker for all of them. Until today, Dr. Davis’ Orange Cream Cookies were our favorite low carb, gluten free cookies. I just finished a double batch of your Pecan Cresents and these take first place – my husband and I agree that we don’t think the glaze is necessary – just because it is Christmas, I’ll probably do the glaze. I also think my next batch will not be the pretty little cresent shapes – I’m planning to just use the small cookie scoop and bake. Thanks for all you do for us – love your blog! My favorite cookie is an almond butter ball or wedding cookie. I’ve recreated them low carb, yummo! One of my favorite Christmas cookies is date balls rolled in coconut. I love that they freeze well, so we can enjoy them all season . . . plus they last slightly longer when you have to let them thaw (although they are pretty good frozen too!). My favorites are peppernuts (pfeffernussen). They were my grampas favorites and my grandma would make them every Thanksgiving-Christmas. I’m going to attempt to make them GF this year! Also, doing all the follows on Pinterest and FB! Can’t wait to try this recipe; thank you! My favorite Christmas cookie is just plain old shortbread. My fav has always been frosted and decorated holiday cut out sugar cookies. And this year they still are thanks to your almond flour cutouts that I made with Swerve!!! Heavenly! It’s hard to have just one favorite.. but I love snickerdoodles. I love Rum Balls at Christmas time. My favorite cookie is Oatmeal Raisin and Cranberry! I LOVE your cookie sheets too!!! My favorite Christmas cookie is pecan shortbread. Love this recipe! Liked all pages on FB and Pinterest! I can’t just choose one, my top 3 favorite Christmas cookies are snicker doodle, peanut butter and sugar!! Every year!! My favorite Christmas cookies are pfefferneuse. I love all types of spice cookies, but pfefferneuse are special to me because of the extra kick from the pepper. My favorite Christmas cookie is the Mexican Wedding Cake. It’s a cookie my mom used to make at Christmas time, so I have always thought of it as a Christmas cookie. I wonder if the Pecan cookie here would taste anything like them? 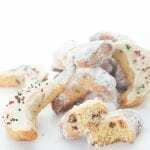 My favorite Christmas cookie is Vanillekipfel (Austrian Vanilla Crescents). Growing up, my Austrian grandmother sent us a huge box of her homemade vanillekipfel every Christmas. We always were so excited when the brown paper wrapped box from grossmama arrived. The smell was heavenly and the taste even better! These cookies are traditionally made with a cup or two of almond and/or hazelnut flours so they were very easy for me to adapt to using only nut flours. This year I am going to use Swerve for the sweetner instead of coconut sugar so my blood sugar won’t spike! Dusted with some powdered erythritol they will look just like our family’s traditional vanillekipfel. Your pecan crescent cookies look very scrumptious, I can hardly wait to make them. My favorite holiday cookie has always been chocolate crinkles. My Mom has made them as far back as I can remember. I can’t imagine celebrating the holiday without them. Guess I should learn to bake so I can make HER a batch. My favorite Christmas cookies are Russian Teacakes (also sometimes called Wedding Cookies). These seem to be fairly similar with the exception of being iced instead of rolled in powdered sugar. Being fairly recently diagnosed as diabetic, I really appreciate this low carb recipe! 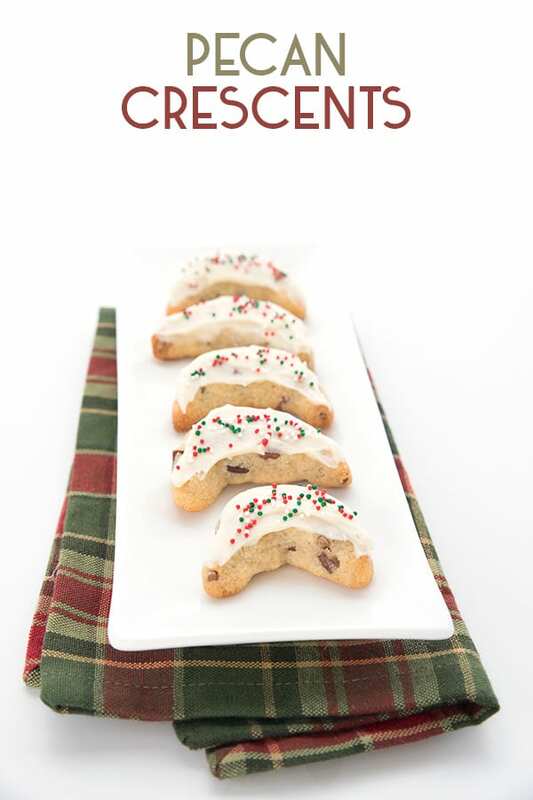 Our favorite Christmas cookies are fruitcake cookies, believe it or not! They are so rich and colorful, made with candied fruit of all flavors and colors. My favorite cookie is Pecan Balls. 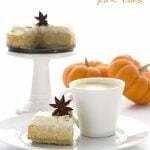 Just liked your FBP Follow Pampered Chef on Pin interest and FB. I love the basic Spritz recipe that came with my cookie gun. It’s fun and easy to decorate, I have a Pampered Chef cookie scoop, and love it! I would love more of their items. They really do a good job with the products. Recipe sounds great! Thanks. In my pre-low-carb days, my SIL gave me this recipe that became a Christmas-only standard: slice-and-bale a roll of sugar-cookie-dough into 36 cookies; stir amaretto liqueur into raspberry jam and spread a thin layer on the bottom of 18 cookies and press the another cookie bottom against the jam to make a sandwich. Melt some chocolate chips and add in a smidge of paraffin. Dip the 18 sandwiches halfway into the chocolate. I haven’t tried to replicate a LC version. I’m Liking on FB. Haven’t done Pinterest but this is an incentive to sign up and try it! P.S. I *ADORE* Pampered Chef! Best veg-peelers in the world… I actually tie one onto bridal-shower gifts! I have so many PC products in my kitchen! My favorite Christmas cookie is the Egg Nog cookie! It’s so good. Before I found out I had celiac disease…my favorite was my grama’s cutout cookies…we would bake and decorate them…I can almost still smell and imagine how wonderful they tasted. Thanks for the memories!! Thanks for the giveaway. Favorite cookies is shortbread cookie dipped in chocolate. I Like The Pampered Chef on Facebook. I love soft sugar cookies!!!! I follow Pampered checf on Pinterest and like it on Facebook!! It’s so hard to pick a favorite, I love so many of them. I guess my favorite today will be chocolate filled Italian cookies. Not sure if there is another name, it’s the name on the recipe when I received it from a little Italian lady from the northside of the city where I live. I now follow Pampered Chef on Pinterest. I now follow All day I Dream about Food on pinterest. I now follow All day I Dream about Food on facebook. I already followed Pampered Chef on facebook. My Favorite is Butter Cookies. I Love Pampered Chef!!! I love chocolate chip cookies homemade. They are my favorite with any kind of nuts. I’d love a batch for Christmas, if any of my friends are in the baking mood. My favorite Christmas Cookie is double chocolate chip cookies with walnuts. My favorite cookie is double chocolate chip cookies with walnuts. Alfajores (pronounced alpha-whore-es 🙂 South American sandwich cookies filled with dulce de leche. I have plans to make them with your dulce de leche recipe but have failed at finding an adequate low carb grain free cookie that won’t fall apart the next day. Would love to win the Pampered Chef lot! My favorite cookie any time of year is chocolate chip. My favorite Christmas cookie is almond flavored spritz. My favorite cookie is the Mexican wedding cakes…. 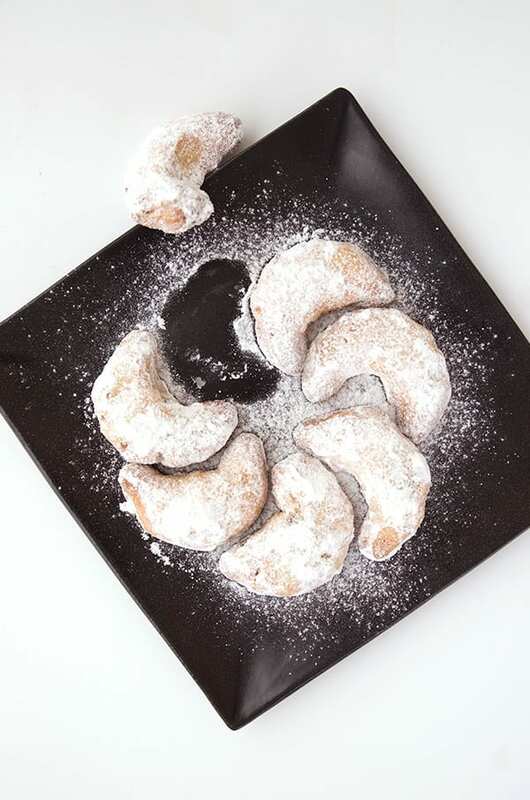 cream cheese dough filled with almond and butter filling and dusted with powdered sugar. Obviously I can’t eat these anymore but maybe you can make a low carb version?! Would love to win this set! Hi Kris…your version of Mexican wedding cakes sounds a little different from what I know…could you send me the recipe so I can try to make them over sometime? my favorite christmas cookie are brownie caramel bars – my mom hardly ever makes them, but when she does I am in heaven!! Your pecan crescents are so precious!! I follow pampered chef on Facebook ! I’ll be honest. 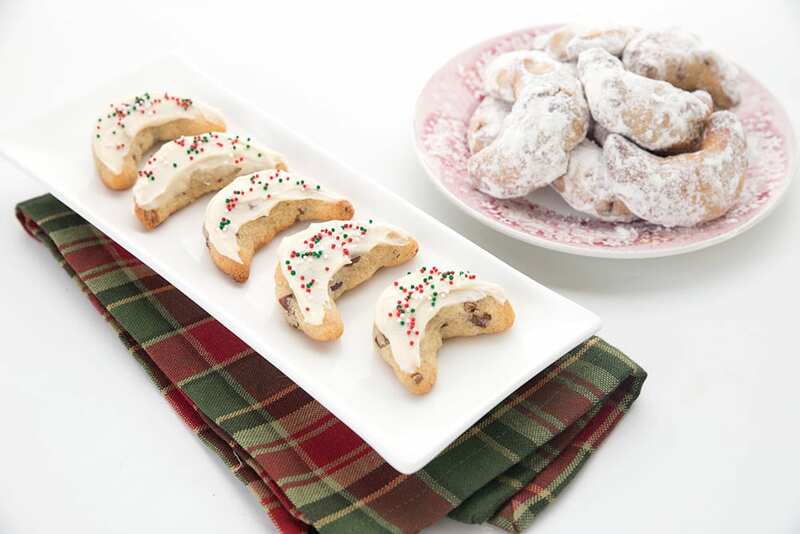 Right now my fave cookies is the Pecan Crescent recipe. Those were great! I added xanthum gum as a precaution-not sure if it needs it. Another fave is anything lemon. TX. i follow pampered chef on facebook!! i follow All Day I Dream About Food on facebook!! my favorite cookies are snickerdoodles!! My favorite holiday cookies is Rugelach with dried cherries. My favorite holiday cookie is Rugelach with dried cherries. My favorite holiday cookie is snow all cookie. simple and delicious. I love your little crescent cookies! Been doing some gluten-free baking this holiday season, so I’m always looking for more good recipes. Thanks Carolyn! I love chewy molasses ginger cookies! My favorite cookie is a simple sugar cookie with nuts. Well, before I was diagnosed with diabetes a month ago, my favorite Christmas cookies were frosted sugar cookies. By next year, I think my favorite will be something from this site! It’s been a lifesaver. Ate your almond flour waffles for breakfast this morning! I liked Pampered Chef on Facebook. Yum! Yet another great transformation!!!! Thank you for sharing your gift of gluten free baking and cooking. I send clients to you blog all the time. Will be making these cookies for an exchange Monday. I love chocolate pecan cookies! My favorite cookie is the snickerdoodle by far! I follow the Pampered Chef on Facebook! I follow All Day I Dream About Food on Facebook! My favorite cookies are traditional sugar cookies. They bring back so many wonderful childhood memories: rolling & using the cookie cutters (I use my mom-in-law’s that she gave me over 30 years ago! ), the smell of them baking, decorating them with the cream cheese Christmas-y frosting (each grandchild gets a specially decorated cookie with their name on it every year) and the my most favorite part- eating them! My favorite Christmas cookie is GINERBREAD!!!! I make them low carb now though . I already follow you on facebook. Now following Pampered Chef on Facebook. I have a few favorite cookies, and they are Chocolate Chip, Oatmeal, Pecan, and Coconut Cookies; Vanilla Cookies; and Shortbread Cookies. I’m following the pampered chef on Pinterest. I’m following all day I dream about food on Pinterest. My favorite Christmas Cookie is the Linzer Cookie made by my co-worker Vanessa. The best cookies EVER. 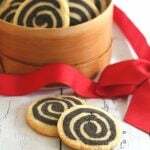 I like pinwheel cookies the best – but I have not been brave enough to try to make them. They seem like too much work! 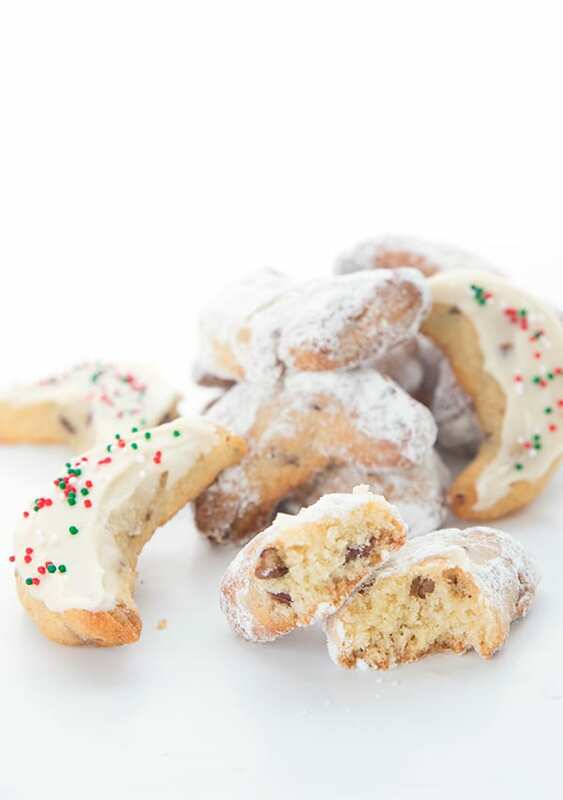 Favorite Christmas cookie would almond crescents! I love to make peanut butter cookies at Christmas. Luv sugar cookies! Bonus that the kids have a blast decorating them! My favorite cookies are sugar cookies made with my granddaughter Brianna. My favorite Christmas cookie would have to be the chocolate sandwich cookies my mom makes with a peppermint filling. My love for simple sugar cookies is profound. THIS Pecan Crescent is my favorite cookie! 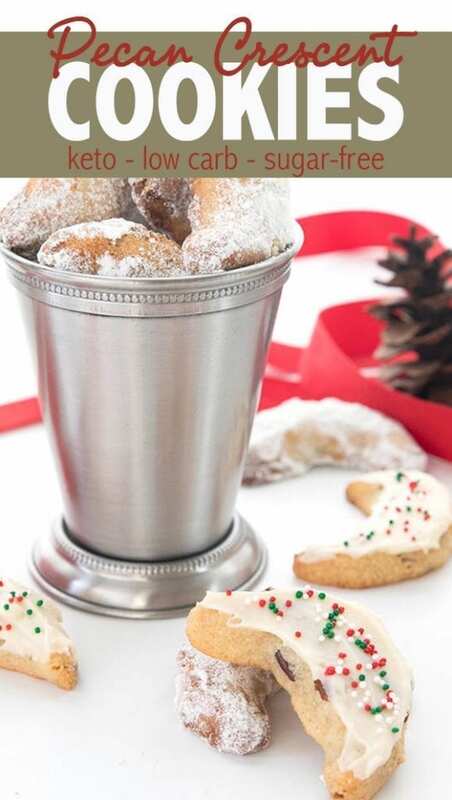 Truly, before I turned to low carb eating, Pecan Sandies, Crescents, Mexican Wedding cookies were my absolute favorite and I could never get enough of them! Thank you SO much for creating this low carb, gluten free version. Without the sugar, I can actually stop at two (one serving) and be content. The flavor and texture are spot on. I didn’t even make the glaze or sprinkle them with erythritol, they’re perfect as is. Thank you again and Happy Holidays!! My favorite Christmas cookie is Nut Butter Balls. It’s a type of sand tart with butter, a little flour and both almond and vanilla extract. We love OREO truffle balls. I wish I had the cookie scoop when I was rolling all them. My favorite Christmas Cookie is pinwheels. I have never actually made them, but my mom used to make them every year. My favorite Christmas cookie is a traditional cut out sugar cookie which we make every year with the kids! The post says this expired yesterday, but I just saw you tweet about it, so… on the off-chance it counts, here I am. 🙂 My favorite cookies are orange cream cookies, which I found the recipe for in a Betty Crocker holiday cookie book a few years ago. They’re divine, and a great departure from all the chocolate and fudge that’s usually around. It will count. I meant to have it run until tonight! I have been sick over the holidays so if I am a little spacey, forgive me. I will go adjust that now! Following All Day I Dream About Food on Pinterest too! I totally missed the contest, but have a question about the recipe. Is there a non-nut substitute for almond flour? Maybe a combination of whey protein and coconut flour? The nut flour is too much for the hubby’s system…I will take a stab at a substitute myself and let you know how it goes, but if you have a suggestion I would love to hear it. Real Vanilla Extract is NOT GLUTEN FREE. You have to use Imitation instead. What brand of liquid stevia do you use? Looking forward to making these! I made these cookies today and they are very good. Did you use sugar-free sprinkles?? where do you buy those? thanks!! I almost dropped my tablet this morning when I saw this post. I am in my early seventies and reading this, too, brings back deep nostalgia for me. I made these every Christmas with my 3 daughters and what fun we had trying to get them hot from the pan into the 1st coat of powdered sugar without breaking them and then into our mouths without burning ourselves. As they cooled we always rolled them a second time in the icing sugar and then left them to set up on a wire rack. Have missed my grown girls so much; making these tomorrow to bring back some special memories and, for that, I thank you. Thanks so much for sharing this recipe! it’s very similar to one that my grandma used to make with hazelnuts and that my father, who passed away a year ago around this time, loved. I’m sorry to hear that you lost your dad, too. I’m going to use your recipe and sub in toasted hazelnuts. I’ll let you know how it goes. So sorry for your loss, Linda. It’s a tough time. Hazelnuts would be delicious! Thank you so much, Carolyn! I hope you had a lovely Christmas! I just wanted to follow up to say that I made these with the hazelnut and the flavor was a spot on match to my family recipe. However, I was trying to cut back on the amount of swerve I was using in the recipe, since I was planning to dust them with swerve confectioners and didn’t want an overload of cooling, so I used allulose for the cookie part and they didn’t crisp up. Do you think the allulose would have kept them from getting crispy? Aside, for a handful of them, I added cinnamon and cardamom to the dusting swerve and it was an absolutely delicious complement to the hazelnut cookie. Once again, I want to thank you for your site, recipes and advice. I have made the most delicious and memorable Christmas meals with your help. Wishing you and your family a very Happy New Year! I look forward to more of your creations in 2019. Hi Linda, I am just beginning to play with allulose myself and yes, I am finding that it affects the consistency of baked goods. Swerve is non-hygroscopic, which means it doesn’t attract moisture. Allulose and other sweeteners like Bocha Sweet do attract moisture. That’s why they help caramel sauce and ice cream stay soft but they aren’t so great for crisp cookies. Thanks! This is great info – I knew you’d have some good insight. I have wonderful memories of my mom’s Christmas cookies and these are one of them. I would sneak into the dinning room and “sample” a few when she wasn’t looking. I hesitate trying keto dessert recipes because they don’t always taste good but these are exactly the way I remembered them! Thank you so much! Hi I am a bit confused! How many cookies in total should this recipe make? If each serving is 2 cookies, would the total number of cookies made = 20 and with 2 cookies per serving there are 10 total servings? Or does the recipe make 40 cookies with 2 cookies per serving for a total of 20?!!! It’s 20 servings at 2 cookies per serving so yes it’s 40 cookies.